Terrible English-dub aside, I think we can all agree Mega Man 8's animated cutscenes were great. Fantastic, even. 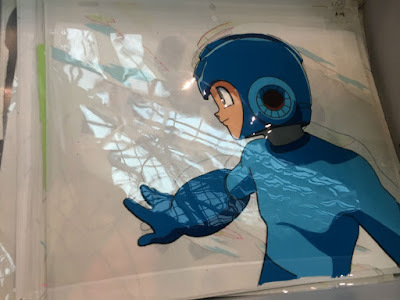 You can imagine just how hyped fellow Mega Man fan Heidi Kemps was when she was offered an entire box of Mega Man 8 animation cels. Heidi snagged the box for a cool $300 back in May at the Fanimecon Swap Meet, according to US Gamer. 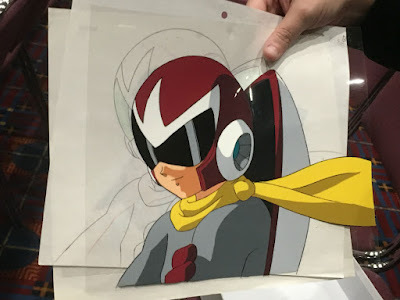 She says, "the seller, noting my interest in historical [Capcom] material, pulled out a giant box of Mega Man 8 cels and offered me the whole thing. "I couldn’t really refuse that, especially after seeing how cool some of the cels looked." I guess the inevitable question you're asking is, "how can I get one?" Well, Heidi plans on offering a few individual cels for sale sometime in the future. Before that happens, though, she intends on making a video showcasing the entire collection. Look forward to it! Be sure to hit up US Gamer for more images and info! Oooooooo. That Proto man cell... what a lucky guy. I'd LOVE one of these. I really enjoyed the entirety of Mega Man 8, and the dub wasn't flatout terrible. Everyone loves to rag on the damn thing. Shoot, I thought Dr. Wily's voice was awesome. But indeed, the animation was outstanding. Owning a frame of it would be a great addition to any collection. I'll be keeping my eyes peeled for when she intends on selling! Agreed. Besides, the U.S. didn't even produce that dub, but hey, let the ignorant 8 haters say what they want. Except for the Astro Man and Tengu Man, the Robot Masters sound even worse in Japanese. The English actors actually the bosses' personalities down better. Oh, my, GEE. I'd be happy to own ONE. What an amazing discovery! How the hell did the seller even come across this stuff in the first place? I have a good guess of which seller sold these as I remember buying some rare Rockman merchandise from a former Capcom employee at the FanimeCon swap meet. Now I’m wishing I could go back in time and hit his booth first... those would have been some real Crown Jewels in my Mega Man collection. Congrats to the buyer who hit the Mother Lode! My favourite game of all time and looooved animated movie too! I played this game againt and again and never got bored. Prefer Japanese version because of voice. An American version is terrible. He is very fortunately o have it. Nice share, rockman-corner! By the way, what about EUROPE version of dub ? Terrible too ? Curiosity. She will sell it even thought she is a fan ? She is crazy. I will keep it and refused to sell it. I respectfully disagree. These are real gems that any MM collector would love to have. Why we never have official art of the animated cutscenes. I just love this draw-style more than Capcom-style. Very nice! It's neat to see these with such clarity when you're so used to seeing the grainy 240p video used in the game. I wonder if an "HD remaster" would be possible with these lol. MM8 was my first PS game and I have a lot of fond memories of it, even if it's not an especially well regarded game. I'd love to have one of these. Someone needs to buy the whole set, scan them as film, and compile a lossless 4K composite.